WASHINGTON -- With the country still reeling from deadly terrorist attacks in Paris, Hillary Rodham Clinton cast herself as America's strongest leader in a scary world, even as she found herself forced to defend her own role during the rise of the Islamic State militants. "This election is not only about electing a president, it's also about choosing our next commander in chief," Clinton said Saturday night in the Democrats' second debate of the presidential campaign. "All of the other issues we want to deal with depend upon us being secure and strong." Amid the backdrop of global anxiety, Clinton found herself fending off questions about not only her foreign policy record but her economic ties, with both Vermont Sen. Bernie Sanders and former Maryland Gov. Martin O'Malley painting the former senator from New York as a lackey for Wall Street and corporate interests. "Let's not be naive about it," said Sanders, noting that Clinton collected millions in campaign donations from Wall Street bankers. "They expect to get something. Everybody knows that." The barbs marked a far more aggressive shift in a primary race that has so far been notable for its civility. Democrats have spent months boasting about the substantive tone of their contest, attempting to set up a favorable early contrast with the "carnival barker" insults of the crowded Republican primary. Clinton faced criticism of her national security record, when Sanders traced the current instability in the Middle East to the U.S. Senate's vote - including Clinton's - to authorize military action in Iraq in 2002. He said that U.S. invasion "unraveled the region." The former secretary of state fought back, saying terrorism has been erupting for decades, specifically mentioning the Sept. 11, 2001, attacks. She said the recent unrest in Libya and other parts of the Middle East is symptomatic of an "arc of instability from North Africa to Afghanistan." She rejected the idea that she and the rest of the Obama administration underestimated the growing threat of the Islamic State. The back-and-forth revealed a foreign policy split within the Democratic Party, with Sanders playing to the anti-war activists who boosted then-Illinois Sen. Barack Obama to victory in 2008. Sanders argued for a far more hands-off approach, advocating for Muslim countries to lead the fight and declaring that the war against Islamic State militants is about the "soul of Islam." Clinton has a history of advocating for more robust involvement across the globe - both as a presidential candidate eight years ago and as Obama's secretary of state. In recent weeks, she has called for a more aggressive U.S. role in the Syrian conflict, including a no-fly zone over the area, a move the Obama administration opposes. But she stood by her opposition to seeking a formal declaration of war against the Islamic State. Foreign relations is an area where Clinton, as a former secretary of state, is in the strongest position to talk about the attacks and the U.S. effort to dismantle the Islamic State group. But she is vulnerable, too, her tenure tied to that of Obama, who's struggled to contain the threat from Islamic militants in Syria and associated terror attacks across the globe. The candidates were meeting in the shadow of the Paris attacks that killed at least 129 and wounded at least 352 people. The debate began with a solemn tone, with a moment of silence followed by previously unplanned foreign policy questions. All the candidates denounced the attacks, the first time the Democratic field spoke about the incidents. They gave some fodder to their Republican critics, who coupled condemnation of the Paris attacks during the day with sharp criticism for Obama and his former secretary of state, Clinton. "We are at war with violent extremism, we are at war with people who use their religion for purposes of power and oppression," said Clinton, arguing the U.S. is not at war with Islam or all Muslims. "I don't want us to be painting with too broad a brush." Sanders and O'Malley agreed with her sentiments, saying the term "radical Islam" used by Florida Sen. Marco Rubio and other Republican presidential candidates, is unnecessarily offensive to American Muslims. Republicans immediately seized on the remarks. "Yes, we are at war with radical Islamic terrorism," tweeted former Florida Gov. Jeb Bush. The conversation later pivoted to economic issues, with the candidates tangling over how to pay for their plans to expand college affordability, family leave and prescription drug coverage. 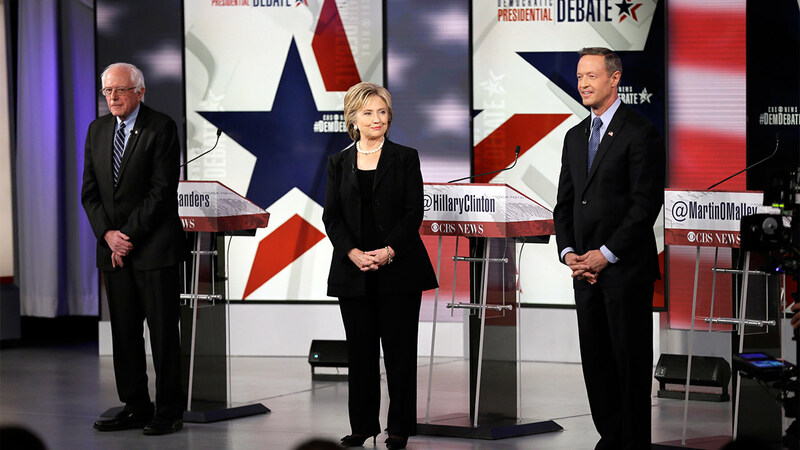 All three agreed that wealthy citizens and corporations should pay more in taxes to benefit the middle class. "I'm not that much of a socialist compared to Eisenhower," joked Sanders, saying the former president backed a 90 percent marginal tax rate. The three tangled over how high to increase the minimum wage, with Clinton backing a $12-per-hour federal floor while Sanders and O'Malley said $15 an hour - the rate being pushed by a campaign of fast-food workers and labor unions. While Clinton is wary of alienating Sanders backers whose support she'll need should she win the nomination, she drew a contrast with him on gun control. Highlighting a vote he took giving the gun industry immunity from lawsuits, she charged him with failing to push hard enough to regulate ownership. Since the party's first debate a month ago, Clinton has built a lead in the early voting states, an uptick that has come amid other signs the party is coalescing behind her. An Associated Press survey of superdelegates published Friday found that half of the Democratic insiders are publicly backing Clinton. Sanders may have inadvertently facilitated some of her progress in the first debate, when he seemed to dismiss the controversy over her use of a private email account and server by saying Americans are tired of hearing about her "damn emails." Saturday night, Sanders declined once again to attack: "I was sick and tired of Hillary Clinton's email. I am still sick and tired of Hillary Clinton's email," he said. "I agree completely," said Clinton, with a laugh.